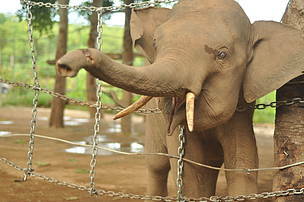 Jun - an 6 years old elephant was found trapped and wounded by the local people. Now Jun is taken care by the Dak Lak Elephant Conservation Center as he was not able to be released back to the wild. In Vietnam, a recent estimation suggests the possibility of Vietnam’s largest wild elephant population going extinct in coming years. Join WWF in learning more about this endangered species and the actions we are taking to prevent their extinction. As a wise saying goes, ‘we don’t inherit the Earth from our ancestors, we borrow it from our children.’ During this month’s celebration of World Wildlife Day (03 March), WWF joined its supporters in appreciating the diverse wildlife of our planet but also recognising the urgent need to save many now endangered species for our future generations. The dry, savanna like forests of Yok Don National Park (YDNP), Dak Lak Province Vietnam, is home to the largest remaining elephant population in Vietnam. Asian elephants (Elephas maximus) are globally threatened with extinction, and the population in Vietnam is no exception. With only 100 wild, elephants remaining in the country, Yok Don’s population of 60-70 individuals is especially precious. Additionally, Dak Lak Province is home to 43 captive elephants, who mainly work in the ecotourism industry. Despite efforts, both captive and wild elephant populations in Dak Lak province have reduced sharply in the last 40 years. From 2009 to 2016, 23 elephants, 32% of the wild population, were found dead in the province, with roughly 75% of them being young elephants. At this rate, WWF has estimated that wild elephants could go extinct in Dak Lak in coming years if no specific actions are taken. According to experts, it is also likely that there will be no captive elephants remaining in Dak Lak by 2045. WWF-Vietnam and YDNP management have come up with an urgent action plan to conserve wild elephants in YDNP from 2016 – 2020. The plan identifies three priority objectives: 1) Strengthening enforcement; 2) Understanding the population size and seasonal movements of wild elephants; and 3) Reducing human-elephant conflicts (HEC). With support from the US Fish and Wildlife Service in 2014 and 2016, 90 of 170 rangers in YDNP were trained in WWF Law Enforcement Minimum Standards. Through law enforcement training, WWF is helping local rangers to protect elephants in the forests in which they roam. WWF have also introduced the cutting-edge law enforcement software, SMART, to help the park manage information on threats to the elephants and begin mapping their movements. But more work is required to ensure elephants persist in YDNP for generations to come. Rangers need more training to protect elephants in the forest around the clock. Local communities need support to avoid the damage wild elephants can do to their crops. And we need to know more about the individual elephants and their herds themselves, because only through deeply understanding these magnificent creatures and their lives, can we effectively protect them. To explore the options and details on how to support our elephant conservation projects, or other WWF’ conservation activities, kindly contact us by clicking here.